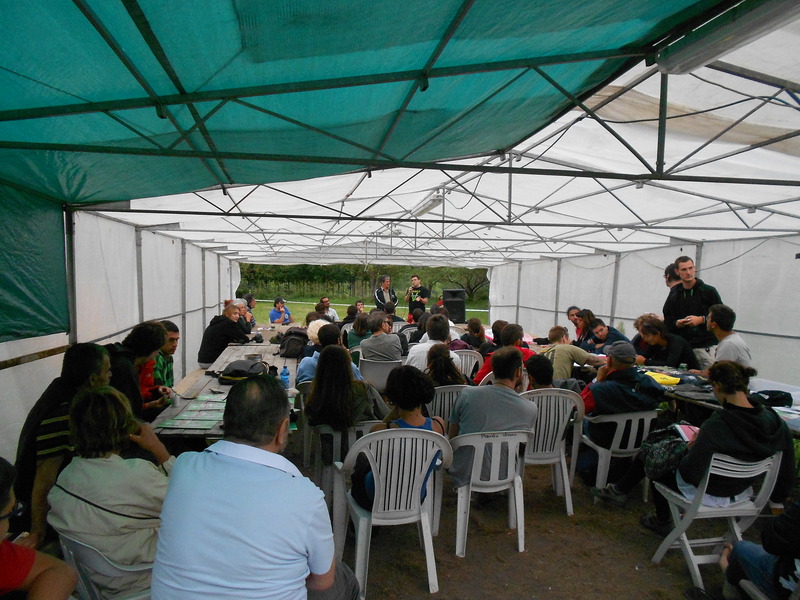 Protest Camps’ Fabian Frenzel visited the No Tav protest camp in Val Susa this summer and met activists from all across Italy and beyond. The struggle against a High Speed Railway Line has long superseded the narrow confines of transport policy. 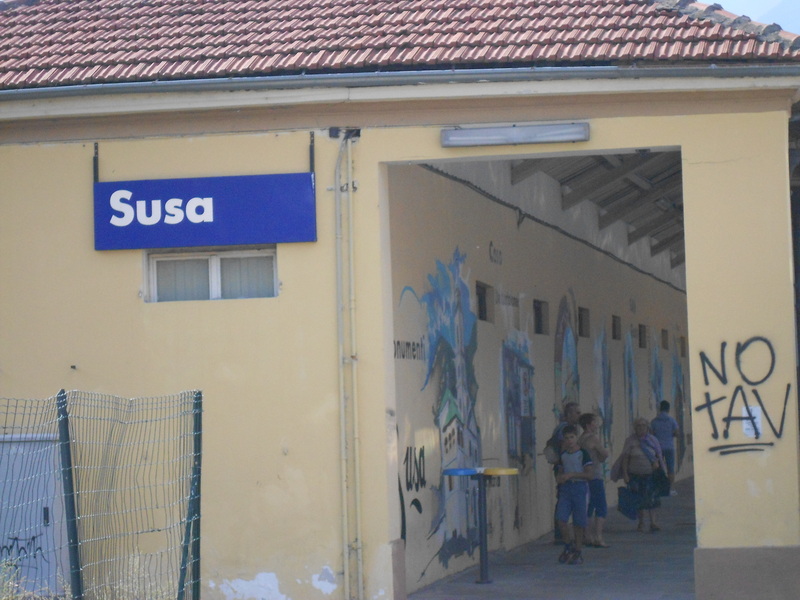 In sum, the goal of this new operation is to escalate the assault on the movement by representing it, legally and through the media, as a ‘terrorist’ movement – a move obviously intended to scare its supporters, turn public opinion against the people of Val di Susa, and legitimize any violence the state will deem fit to unleash against them. We do not think this operation will succeed. 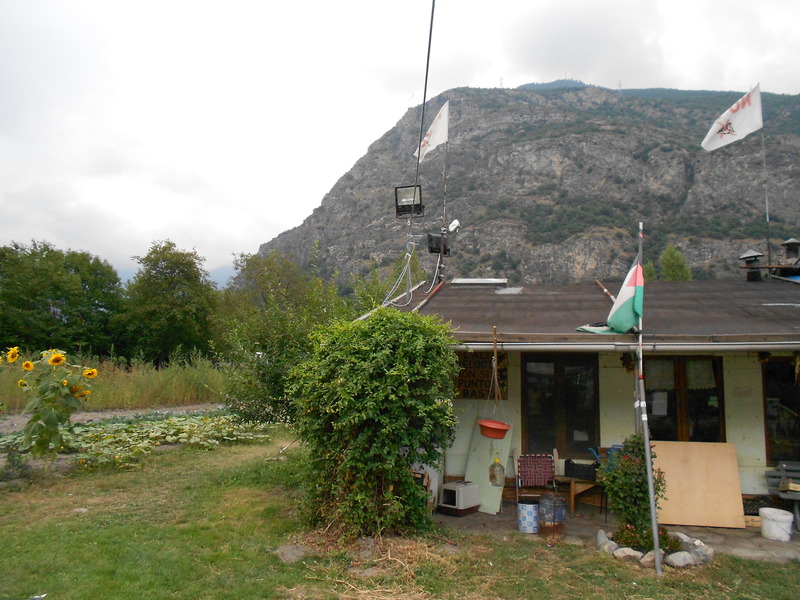 The people of Val di Susa have fought the fascists, have fought the Nazis, and for twenty years they have been able to push back the attempt of the Italian government to destroy their mountains, already traversed by many railroad lines and a recently constructed highway. I entered the valley from Turin on the existing railway line. As the mountain ranges narrowed I saw a massive graffito drawn in white stones on the dark rock surface: TAV=Mafia. Accusations of Mafia involvement focus on two concrete companies in the valley who would profit from the planned work. There is also collusion between legitimate businesses and the ruling parties in Italy. That concerns, for example, the former cooperative CMC, Cooperativa Muratori e Cementisti, today a multi-national cooperation, but still linked to the governing democratic party. CMC is to build the base tunnel of the new line. And then there are the environmental concerns, as tunnels will be dug through asbestos and naturally occurring uranium deposits. Most importantly, opponents say, the new line is a gigantic waste of money. Although the plans have been scaled down significantly in recent years, there are still costs in the range of 10 billion Euros. But studies show that demand (passenger and freight) on the route has diminished in the last 10 years, while capacity gains on the existing line could be achieved with much smaller investments (Greyl at al. 2011). To a lot of Italians who are subjected to a stringent austerity programme to tackle high levels of public debt, an expensive new railway line does not make a lot of sense. An increasingly important feature of the struggle have been the No Tav Camps, of which there are currently two. I visited one of the camps, located on the site of the succesful 2005 mobilisation of the ‘Free Republic of Venaus’. In 2005 mass occupations of 30.000 protesters brought building works and the initial plan for the line to a grinding halt. Since the succesful occupation the site has developed into a permanent base for the No Tav movement. I attended an Italian wide meeting of university collectives, who were listening to presentations from Brazilian and Turkish activists, discussing connections between the struggles. Why do activists from the different universities across Italy come to Val Susa in the far North of the country? How has the local struggle become a point of convergence for the Italian radical left? Like many recent protests the No TAV movement initially consisted of resistance of a specific infrastructure project, the high-speed railway line. But in the 20 years of its existence the protest has grown to become much more. Indeed many in the Italian left relate to the NoTav movement as a source of inspiration in struggles that aim to defend and create commons against capital. The camps (presidios) of No TAV feature importantly in this struggle. More than simple basis for action and observation, the camps have become places where alternative futures are made. People live together, vegetables are grown, but between actions as well, politics are being discussed, futures imagined and created. Alternative worlds includes very good food indeed. As I was complimenting my prima plate of delicious pasta, an activist next to me nodded approvingly: This is Italy, you cannot mess with the food. He was based in Rome and wondered, as we were queuing for our second course, whether the local resistance movement had distanced themselves enough from primitivism and regionalism in the local No Tav coalition. But Turin based activists from the social centre scene there were upbeat about the convergence of diverse protesters, including an old lady who inspired by Catholicism protested daily against the building works and once claimed to be “the grandma of the black block”. Like in other camps, No Tav enables the building of new coalitions, as antagonism and a shared practice of resistance create new common politics. Increasingly international, there are good summaries of the struggles and the arguments of No Tav in english. For an overview of the 20 year history of the struggle with links to videos in english check this Brief History of No TAV. For a more thorough analyses of the struggle providing background, data, see Lucie Greyl, Sara Vegni, Maddalena Natalicchio and Jessica Ferretti study of High Speed Rail in Italy. And most importantly, make a visit to the valley to see for yourself. This entry was posted in protest camps and tagged Camps, Italy, No TAV, Resistance. Bookmark the permalink.